Pinan Shodan seems to deal mostly with someone who has hold of your wrist or lower arm using the same side of their body. For example holding your left arm or wrist using their own right arm. This could typically be an attempt to restrain you or prevent you from leaving their presence. If the opponent is left handed, it may instead be a precursor to an attack like a punch. The resulting applications appear to be shoulder or arm locks. Note in the movement column, the number denotes the approximate movement number within the kata. This is purely for reference, when performed the movemends flow one to another, there are generally no discrete movements, this is particularly the case when turns are made, the katas often make use of the turn in both the applications. Raise right arm above head, bent at right angles and simultaneously raise left arm directly in front, bent 90 degrees at the elbow. Thrust your right arm down, keeping your elbow bent and extend out to your left. Simultaneously pull your left fist towards your right ear. Pull both your arms apart violently. The left extended straight out to your left at chest height. The right arm is pulled to the hip. Raise left arm above head, bent at right angles and simultaneously raise right arm directly in front, bent 90 degrees at the elbow. Thrust your left arm down, keeping your elbow bent and extend out to your left. Pull both your arms apart violently. The right extended straight out to your right at chest height. The left arm is pulled to the hip. Heian Nidan: Turn your head to the rear, leave your body facing to the right, pull both hands back to the left hip and bring both feet together to Heisoku-dachi. Pinan Shodan: While still facing to the left bring right arm back across to begin uchi-ude-uke (inside to out block). Turn head to the rear and follow with body, extend right leg in Nekoashi-dachi. Pinan Shodan: Bring your right arm up and across to the right completing uchi-ude-uke (inside to out block). At the same time kick mae-geri gedan (lower front kick) with your right leg. Turn to the front and step out with your left leg into [Heian Nidan: back stance (Kōkutsu-dachi)] or [Pinan Shodan: Nekoashi-dachi] while executing shuto-uke. Step forward in Nekoashi-dachi (Heian Nidan: Kōkutsu-dachi), execute shuto-uke to the front with right leg and right arm forward. Step forward in Nekoashi-dachi (Heian Nidan: Kōkutsu-dachi), execute shuto-uke to the front with left leg and left arm forward. Lunge forward with right leg into zenkutsu-dachi and thrust the right hand out with nukite. [Pinan Shodan: Pull left hand back to the hip.]. Step across to the right with your rear left foot. Rotate anti-clockwise 225° into shuto-uke. Step forward in Nekoashi-dachi (Heian Nidan: Kōkutsu-dachi), execute shuto-uke with right leg and arm forward. Rotate 90° to the right into shuto-uke in Nekoashi-dachi (Heian Nidan: Kōkutsu-dachi) with the right hand and foot forwards. Step forward in Nekoashi-dachi (Heian Nidan: Kōkutsu-dachi), execute shuto-uke with left leg and arm forward. Execute uchi-ude-uke to the front in zenkutsu-dachi with your right arm. Kick mae-geri (Heian Nidan version is at the chudan level, the pinan version is at the gedan level) to the front with right leg and step forward as the foot comes down. Punch gyaku-tsuki chudan with left arm. Execute uchi-ude-uke to the front in zenkutsu-dachi with your left arm. 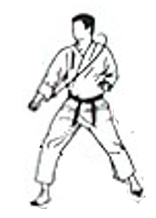 Kick mae-geri (Heian Nidan version is at the chudan level, the pinan version is at the gedan level) to the front with left leg and step forward as the foot comes down. Punch gyaku-tsuki chudan with right arm. Step forward in zenkutsu-dachi with your right leg. Simultaneously execute morote-uke to the front with your left arm supporting your right arm. Execute gedan barai at 45° in zenkutsu-dachi with the left leg forwards. Execute age-uke to the front in zenkutsu-dachi with right leg and arm forwards. Rotate to the right 90° and execute gedan-barai while stepping forward into zenkutsu-dachi. Execute age-uke to the front in zenkutsu-dachi with left leg and arm forwards. Rotate back and to the left 45° into hachiji-dachi - yoi (ready) position.